As the Class of 2011 was honored at the Graduation Ceremony and 22nd Annual Turfgrass Student Awards Banquet, Rutgers paid homage to one of its own: Kenneth Krausz, class of 1986. Born in 1955 in Ridgefield Park, NJ, Ken's first job was working on a vegetable farm adjacent to his house. His love of plants and outdoor work lead him to take a laborer position at Old Tappan Golf Course and to enroll in the Rutgers Professional Golf Turf Management School. During his second year at Rutgers, he was promoted to Golf Course Superintendent. Soon after, he accepted the Director of Greens and Grounds position at Paramus Golf Course, and worked there for over 22 years. Ken's deep roots in turf ultimately sparked an interest in starting a private company. With a partner, he opened Sports Field Management Systems, a sports maintenance company. Although now "retired," Ken still works as a seasonal employee at Provident Bank Park, home of the Rockland Boulders baseball team in Ramapo, New York, where he continues to nurture his passion. One of the highlights of his 40+ year service as a firefighter was when he and his fellow fire fighters helped rebuild a home for a deserving family for an episode of "Extreme Makeover: Home Edition." In 1978, Ken met Kathy Staron, the future Mrs. Krausz, and together they raised two daughters. He is currently enjoying being a grandfather. Not surprisingly, Ken's presentation to the 2011 graduating class highlighted the importance of community service, volunteerism and family. Rutgers can always count on Ken to help nurture the next generation of young superintendents and to be a strong advocate for the Professional Golf Turf Management School. 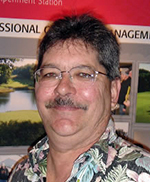 Ken's love of plants led him to the golf turf industry, where he excelled after studying at Rutgers. Active in both professional organizations and community groups, Ken has always been eager to help others. Ken currently enjoys being a grandfather and working part-time at Provident Bank Park.